If you are inclined to romanticism you could acknowledge the aroma of caramelized butter as the distinctive fragrance of Paris. Butter really is one of the key ingredients of the French cuisine, and nothing is more quintessentially French than croissants pûr beurre. This delicious pastry is a breakfast staple and should be bought in a boulangerie, asked à emporter – to take away – and smuggled everywhere you need to go. You should really avoid those you find in cafès: they are often a bit stale, too papery and definitely not as fragrant as they should be*. Plus, there must be few life pleasures comparable to the one you get by plunging your nose in the little paper bags in which bakers slip your croissants. Butter and flour can do wonderful things together and the pâte feuilletée – of which croissants are made – is a real culinary miracle made of patience and love. This light, flaky, leavened puff pastry is made by layering a stick of laminated butter on a simple sheet of dough made of flour and water. To make it properly you have to fold the dough several time respecting a very specific method: each folding will make the dough rise through the evaporation of the fat into steam so that the inside will be gorgeously puffed up whilst the outside will be crispy and golden. When you take a bite of a genuine croissant pûr beurre you make a mess: it crumbles in your hands and when you chew it you can feel the distinctive sound of crispy outer layers melting with the soft, buttery inner layers in an inimitable, perfect mouthful. It’s the mess that enables you to tell a croissant made with butter from one made with bad quality fat (for example, margarine EW!). The perfect croissant must also have a very subtle salty taste given by the addition of a pinch of fleur de sel to the dough. This almost indiscernible – but definitely there – flavour makes the croissant perfect to either be eaten alone or cut in half and topped with a thin veil of jam or to welcome savoury fillings, if you want to take your sandwich to a whole other level. Be wary of soft and heavy croissants. Genuine ones weigh almost nothing, they don’t spring at the touch but crumble at the slightest pressure you apply on the crust, they smell of caramelized butter and are not sweet. The final proof is in the “ears“: the croissant’s extremities are the best part and must be crispy and crunchy, perfectly golden brown. 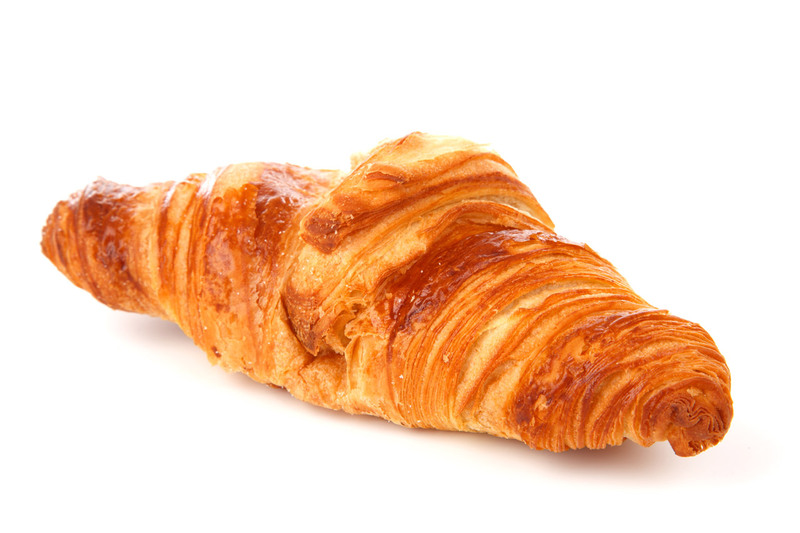 Next time you are in Paris why don’t you go on a quest for the best croissant? It’s a tasty game: you wake up rather early and you start roaming the city stopping at every bakery whose aroma whets your appetite and you eat your warm croissant while you get lost in the arrondissement. Trust your nose to find the next one! I challenge you to stop. The birth of modern croissants is believed to be dated around 1838-1839 when an Austrian officer moved to Paris where he opened a viennoiserie, an Austrian-inspired patisserie. There he re-elaborated an existing sweet staple of his old Empire, the kipferl. This pastry was rumoured to be a denigration of the Ottoman Empire who lost the seige of Wien back in the 17th century. That’s the reason why croissants are boycotted by several fundamentalists. If you crave a croissant but you don’t live in France or you’re desperate to impress a certain someone you could try my outrageously cheaty version of a French Croissant, check this out! I’ll immediately clutch your rss as I can’t find your e-mail subscription hyperlink or newsletter service. Do you’ve any? Kindly allow me know so that I may just subscribe. Thanks. If some one wants expert view regarding running a blog then i recommend him/her to pay a quick visit this web site, Keep up the good work. you are in point of fact a just right webmaster. The web site loading speed is incredible. It kind of feels that you’re doing any distinctive trick. Also, The contents are masterwork. you have done a wonderful job in this subject! I’m no longer sure the place you are getting your information, but great topic. I needs to spend some time studying more or figuring out more. Thank you for fantastic information I used to be looking for this information for my mission. world, after establishing it largely inside the Usa and You.K. and video but, these need a plug-in installation). I really wish you would post a picture of a cross section showing what the inside of a “perfect” croissant actually should look like. I worked with a genuine French pastry chef trained in Alsace France during the fifties and sixties (he trained me during the late seventies and early eighties. We actually did use a mix of butter and margarine, but when he first opened he used pure butter. He had some trouble competing with various older bakeries locally. His dairy supplier was the one who alerted him by his surprise at how much butter he was ordering since the driver had never seen any of his customers order so much of it. When he learned that NOBODY else in the entire region used ANY butter in their pastries, he decided to start experimenting. Truth be told, the local clientele just were not used to pure butter pastries so his stuff probably didn’t taste quite right to them so he decided to try various mixtures. I forget what the ending ratio was exactly but I do remember it was pounds of butter to a “baton” and the rest was margarine. For those of us who love butter, we could tell but it was tolerable. What I remember about our croissants is that if you cut them in half the center was hollow. The outside was all layers of flaky crust, bound with very thin layers of doughy buttery goodness. Most of the images I can find on the internet of croissant cross sections look like the texture of course bread, although I know it would be much lighter than actual bread. Anyway, they simply look wrong to me. Like a honeycomb structure almost, but all the way through. No hollow interior. Our hollow interior was what made it possible to actually fill some of them with various fillings AFTER they were baked. This much I remember. And I’m giving away the recipe because it is the worst kept secret in French baking anyway. You’ll have to break down the ratios yourself because this is a BAKERY recipe after all. We spoke in “gallons” when it came to how much to make. Gallons refers to the amount of water used. If you just want to make french bread, that’s all you need, but remember NOT to add the salt until the last stages of mixing. In this recipe (full for a bakery), you would mix everything EXCEPT the salt for twenty minutes, adding the salt three minutes before the end of mixing. This rule can be followed no matter how large the mix is, from one to eighteen gallons (I’ve never worked with a mix bigger than this). There is a lot more be said about how to work with the dough for french bread but that’s a different topic. Suffice to say you need to work that dough to keep it stiff as possible without tearing. Do NOT EVER use all purpose or cake flour. You NEED high gluten BREAD flour!!! This is NOT a marketing gimmick like so many other things are. Bread flour is HIGH GLUTEN and makes a far different loaf than other flours. So basically, our recipe for croissant dough was exactly the same as for french bread, except with sugar added to the dough. I AM PUTTING THIS LINE IN ALL CAPS NOT TO SHOUT BUT TO ALERT ANY READERS TO MY UNFORTUNATELY FAULTY MEMORY! I CAN’T REMEMBER HOW MUCH SUGAR WAS ADDED TO A ONE GALLON RECIPE!! For some reason I want to say 13 ounces sugar. The rest was all about the raising, rolling out and adding butter and margarine in layers by applying 1/2 of the semi-soft butter and margarine to one third of a rolled out sheet of dough, folding over that third and applying the other half on top of that, then folding the remaining third of the dough sheet on top of the whole thing. Then we would roll that out into a sheet the same size as the first sheet and fold that into thirds. So the first application of fats gave us three layers, and rolling it out and folding it again gave us nine. Refrigerate the baton for one hour. Roll it out again to the same size as at the first, fold over in thirds, for 27 layers. Refrigerate for one hour or freeze for later use. I’m thinking now that the major difference between ours and what I see on the internet for the most part, probably is the flour. Most people, when they hear the word “pastry” probably think cakes and such and don’t think “pasta,” which basically just means PASTE, and applies to anything that is made from water and flour and possibly other ingredients such as salt, and can even include cakes and other crumbly textured pastries, but croissants are something very different. They are eaten for breakfast all over Europe but they are not coffee cakes, they are not doughy. They are primarily FLAKY. There shouldn’t be any resemblance to most western hemisphere breakfast pastries. They should crack when you bite into them. There should be SOME layers of doughy consistency inside, but that consistency shouldn’t make up the entire inside of it. there should be a cavern inside, into which fruit preserves can be inserted (by the consumer or by the bakery). Sometimes bakeries will intentionally form “croissants” into shapes that better serve being filled after baking. Doing so however, calls into question whether these particular pastries should actually be called “croissants,” which actually means crescent in direct reference to its shape. Chocolate “croissants” are never shaped like crescents, nor are most other filled “croissants” simply because shaping them in a way that allows filling after baking REQUIRES they not be in a crescent shape because the crescent requires tapered ends into which it is impossible to insert filling after baking without destroying the integrity of the flaky structure of the pastry. Although, chocolate i s rolled into the dough and could be formed into a crescent, it isn’t usually done because the middle would be filled with chocolate while the ends would be baron of it. We used to make almond croissants, which were filled before baking with almond paste filling (NOT frangipan!). Don’t ask me what was in those because I honestly can’t remember. My absolute favorite croissant was our ham and cheese, which was placed inside before rolling and baking. Smoked ham and Lorraine cheese. Awesome! Sorry, I got lost down memory lane for a bit there, but something posted on Facebook (curse that website! ), got me on this track, which got me Googling, which led me here, and the rest is obvious if you’ve read this far. Звони мне дорогой, я хочу слышать твой голос.